13" MacBook Air, i7 8GB RAM 256SSD ordered! - Solidworks on a Mac!Solidworks on a Mac! 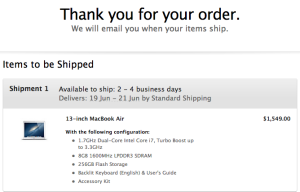 13″ MacBook Air, i7 8GB RAM 256SSD ordered! After much argument at work as to why a Macbook is just as capable a machine to run Solidworks on, I finally have one on order. I figured I would wait until the new Haswell chips were offered in the Macbooks. The expected boost to graphics performance, plus extended battery life should make my user experience seamless when transitioning from a 5 year old tricked out Dell desktop PC. Based on price point, the Macbook Pro seemed to be a great machine to run Solidworks on. For the additional bit of weight, the added drive space and processor options should be much better suited to what SW requires. With Cook’s lack of presentation of an updated Macbook Pro at the WWDC conference this year though, it looks like a few more dollars for a Macbook Air will be the way to go. I’ll elaborate a little more later on, but for now the focus is on just setting up the site! Posted in Blog Updates and tagged macbook air, solidworks 2013, Solidworks on a mac. Bookmark the permalink. RSS feed for this post. Leave a trackback. 2 Responses to 13″ MacBook Air, i7 8GB RAM 256SSD ordered! Actually I am planning to buy a Mac Air 11 inch model…What would be the best configuration for running solid works in 3d with the same and one more thing….. Do I need to buy windows 7 or can I download a torrent for the same….????? Not sure how the i5 in the 11inch would work. I haven’t checked yet, but can you do the 8GB ram upgrade in the smaller model? I really think the extra RAM is required to get stability, as that monster ASUS laptop I had was really unstable when running Solidworks 2012. As for the Windows 7. I downloaded a torrent, but bought the OEM disk for the key. It’s a work machine, so I might as well keep everything legit.